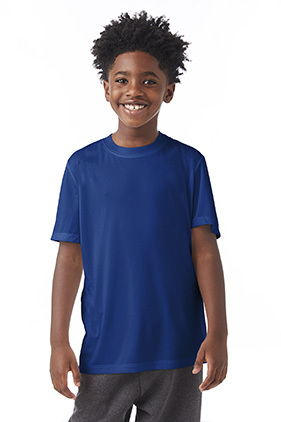 100% polyester interlock 4 ounce jersey youth unisex performance t-shirt. Fresh IQ fabric treatment for advanced odor control. Fabric has inherent moisture wicking capabilities. 50+ UPF rating, excellent UV protection. Suitable for screenprinting and sublimation. CPSIA tracking label compliant. Side-seamed. Tagless neck label.